A new inlet was formed during Hurricane Matthew near Fort Matanzas National Monument, Florida. Pre- and Post-storm imagery from NOAA (http://storms.ngs.noaa.gov/storms/matthew/). Hurricane Matthew impacted a large portion of the U.S. Southeast coast, from Florida to North Carolina, from October 6-9, 2016. Preliminary observations from tide gauges along the coast indicate storm surge reached 1 to 3 meters above predicted tides. Offshore wave heights in excess of 9 meters were observed near Cape Canaveral, Florida. These large waves contributed to an additional 2 to 5 meters of wave runup at the shoreline. 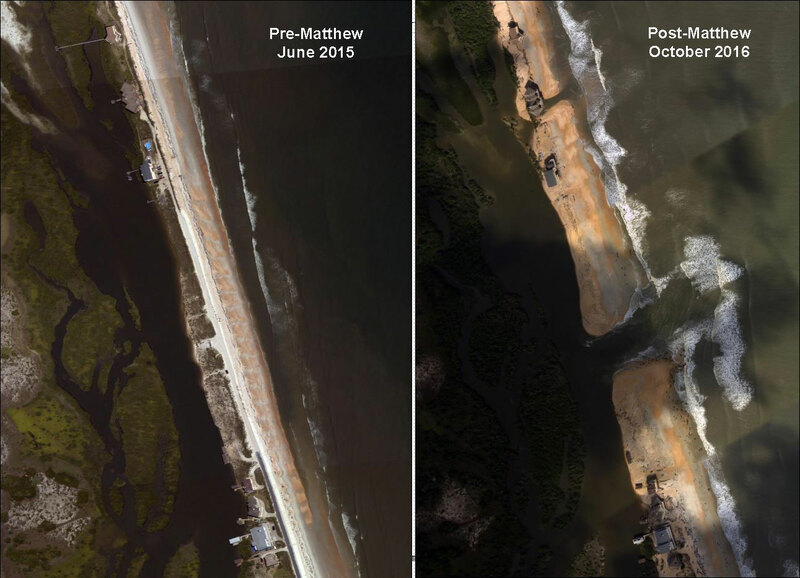 The combined effects of surge and storm-induced wave runup created elevated total water levels at the shoreline, causing extensive erosion of the beach and dunes. Oblique aerial photography of the coast from Port St. Lucie, Florida to Kitty Hawk, North Carolina collected October 13-15, 2016. Post-storm airborne lidar survey of open coast shoreline from Florida to Virginia, planned collection October 26-November 23, 2016.